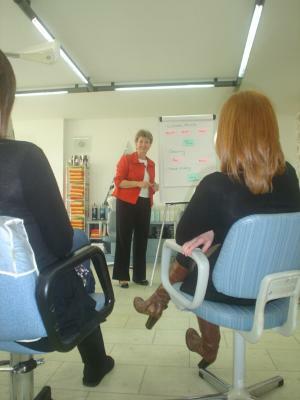 The owner of a South Gloucestershire hair dressing salon has engaged a local training consultancy to teach her staff how to run the business while she is away on maternity leave. When Alison Sims who owns the Eclipse Hair Salon in Charfield, South Gloucestershire discovered that she was expecting a baby she hit on a novel way to support her staff to manage the salon as she will be unable to be in the salon every day. She approached Red Door Coaching and Training Ltd, also based in Charfield, to conduct some customer service refresher training along with some of the practicalities of running and managing a business. Alison said: “I read about Red Door earlier this year when they warned that if there was a general election then some of the training grants which are currently available could be withdrawn. I decided to contact Red Door before it was too late as this seemed too good a chance to miss. I will still be around in the salon when the baby is here but this training means that I can leave the day to day running to the staff with the confidence that our clients are still in great hands. A few months ago Red Door discovered that grants of up to £1000 which are currently available through the Learning and Skills Council’s Leadership and Management . Advisory Service could be withdrawn should there be a new Government in office. Local businesses such as The Swan Hotel and The Edge Health and Beauty Centre have already successfully tapped into this scheme to fund training for their teams. The scheme is available to any businesses with between five and 249 staff (including volunteers) and provides an initial grant of £500 for training and development of staff and another £500 if the business chips in with the same amount to take things further. Red Door Director Tracy Francksen said: "We haven’t had any confirmation yet but the indicators are that the scheme is going to be axed. If the speculation in this weekend’s press is anything to go by then it is almost certain. Alison has had the foresight to take advantage of this free training to ensure that her business is left in the safe hands of her staff while she is away. It isn’t too late for other businesses to apply for similar funding but they will have to hurry. It really is a gift. If a small business wants to conduct staff development of any kind and improve on skills such as customer services, marketing or leadership and management then this is too good a chance to miss." Picture Caption - Tracy Francksen of Red Door Coaching and Training (standing) trains Eclipse Hair Studio staff to manage the salon.